Daniel O'Reilly celebrates scoring a goal alongside his Longford team-mates. 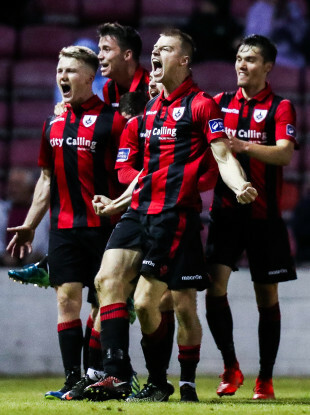 LONGFORD TOWN BOOKED their place in the quarter-finals of the Irish Daily Mail FAI Cup for the second year in succession, with Dylan McGlade outstanding for the Midlands outfit who cruised to victory on Saturday night. Shelbourne will wonder how they were so far off the pace in the second half, failing to perform after a positive opening half, though Longford starred with some fabulous midfielder displays — Dean Zambra, Aodh Dervin and Darren Meenan superb in the central roles. Small margins play a big part in sport and Shelboune had two great chances to take the lead in the opening half, with striker Davy O’Sullivan’s 19th minute effort blazing over the crossbar, after an excellent cross from full-back John Ross Wilson. Longford then had their goalkeeper to thank that the game remained scoreless, as Michael Kelly produced an outstanding save to deny Lorcan Fitzgerald from close range, with Greg Moorehouse firing the rebound over the bar. Those are the guilt edge chances that teams have to take in close games and, in fact, both were against the run of play with Longford looking very comfortable in possession without creating any real clear-cut goal chances. The game turned on it’s head completely before the interval, with the hosts awarded a penalty in the first minute of stoppage time, after winger McGlade was taken down by Reece McEnteer. Referee John McLaughlin rightly pointed to the spot. McGlade, who has impressed with 11 goals in the First Division this season, made no mistake with the penalty. He succeeded in sending goalkeeper Dean Delany the wrong way as Longford took a 1-0 lead into the dressing room at half-time. The second half was a very one-sided affair, with Owen Heary’s side folding completely in the Longford thoroughly dominant, using the ball very wisely. The game was put to bed in the 72nd minute with McGlade again contributing. The left winger sent in a delivery from a corner which was met by centre-back O’Reilly, who volleyed into the back of the net from close range. The hosts held out for a comfortable 2-0 victory, with the last eight now beckoning for Neal Fenn’s side, who last won the FAI Cup back-to-back in 2003 and 2004. LONGFORD TOWN: Michael Kelly; Shane Elworthy (Tumelo Tlou, 90 + 4), Tristan Noack-Hofmann, Daniel O’Reilly, Karl Chambers; Peter Hopkins (Dean Dillon, 90 + 1), Dean Zambra, Aodh Dervin, Dylan McGlade; Darren Meenan; Jamie Doyle. SHELBOURNE: Dean Delany; John Ross Wilson, Reece McEnteer, Derek Prendergast, Lorcan Fitzgerald; Greg Moorehouse, Alan Byrne (Gavin Boyne, 26), Karl Moore, Adam Evans (Shane Farrell, 75); David O’Sullivan, Paddy Kavanagh (James English, 57). Email “McGlade and O'Reilly steer Longford into FAI Cup quarter-finals as Shelbourne bow out”. Feedback on “McGlade and O'Reilly steer Longford into FAI Cup quarter-finals as Shelbourne bow out”.